This deck was released after supposedly being discovered by a USPCC employee looking through a book of old card back designs. The Dragon Back was designed decades ago, possibly in the early 20th century, but there is no record of it ever being produced. 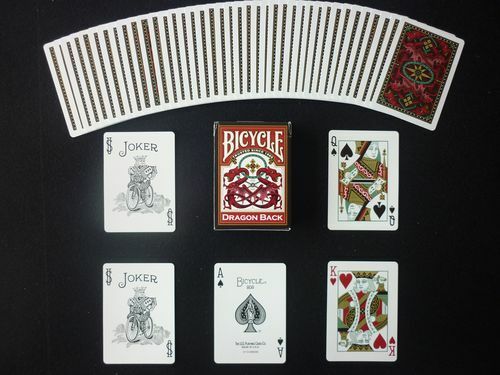 The cards have standard Bicycle faces apart from the green colour scheme one the court cards which match the backs. Additionally, the Hearts and Diamond pips are in a darker shade of red. Comes with 2 standard Jokers and a double backed gaff card. 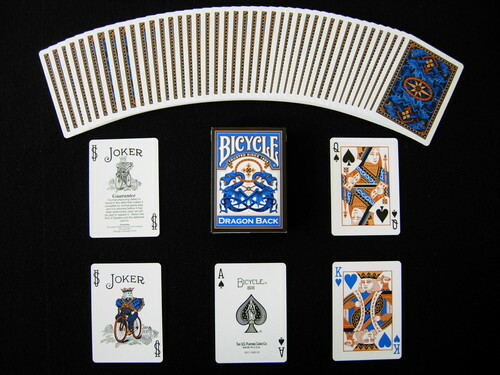 The Dragon Back deck was reprinted in a blue colour, with blue instead of red on the Hearts and Diamonds and a new blue and orange colour scheme on the court cards. Comes with 2 Jokers (one in colours matching the deck, one with a guarantee printed on it) and a double backed gaff card.